Delivery to Port Orleans French Quarter or Riverside rooms or poolside from 4 pm until 1am. Touch “Dining Options” on your room telephone to place your order, or dial extension 5787 (or 1-407-934-5787) option 1 from the pool bar. A $3.00 delivery charge, applicable sales tax, and 18% service charge will be added to all orders. We respectfully request a minimum order of $15.00. Guests on the Disney Dining Plan and Deluxe Dining Plan will redeem two (2) Table Service Meals from their meal plan balance for each In-room Dining Pizza ordered. Gratuities are included. Note: Pizzas are made fresh to order at the Port Orleans French Quarter food court, which also provides the delivery service for guests staying at Port Orleans Riverside, Old Key West, and Saratoga Springs resorts. The wait time can be a bit variable depending on demand, and although they aim to have your food with you within 30 minutes, waits of over an hour are not uncommon. Safety Tip: Fliers placed under your door (e.g. 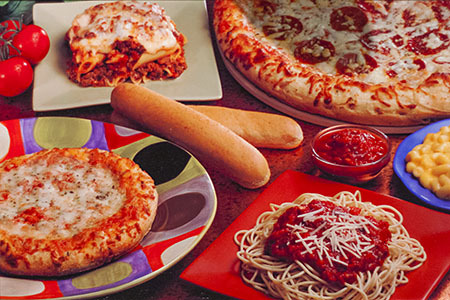 pizza or food delivery services) are not legitimate communication from the Walt Disney World Resort. Please protect yourselves and your personal information [especially payment card details] by using Walt Disney World approved vendors during your stay. Florida State beverage law prohibits the possession or consumption of alcoholic beverages by any persons under 21 years of age. Alcoholic beverages will not be left in a room unless there is an adult 21 years or older with a valid ID.